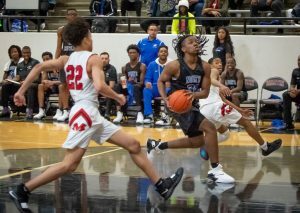 The North Crowley Men’s Basketball Program marched into hostile territory on Friday night to do battle as they traveled to the home of perennial rival, Arlington Martin HS, to take on the Martin Warriors… Outcome? NC won at every level! 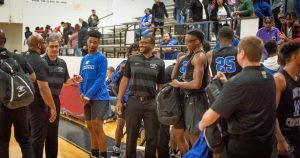 The Panther fans, who knew that North Crowley had already taken care of business at the Freshman B, Freshman A and Junior Varsity levels prior to the 7:30 Varsity tip all stuck around to watch the “heavy weight” finale between the top 2 teams from District 4-6A. 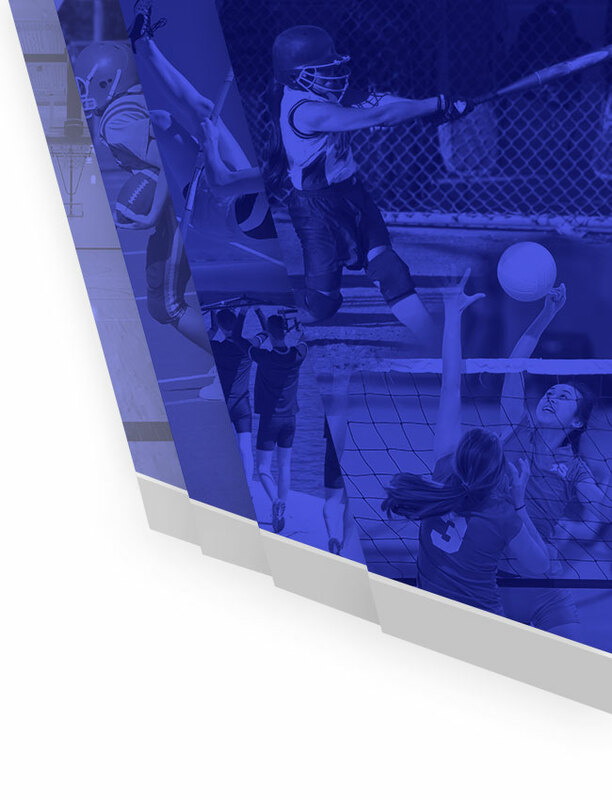 North Crowley entered the game with a perfect 12-0 district record and Arl. 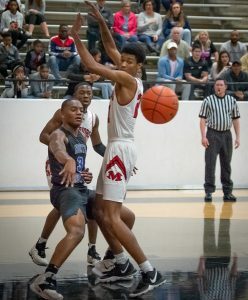 Martin entered the contest at 11-2… Even though the Panthers still would have controlled their own destiny for a district title with a loss, they had the opportunity to clinch on Friday night with three games left to play with a win. As news media, pod-casters & fans from both sides packed the Martin gym to near capacity, both teams geared up for battle! 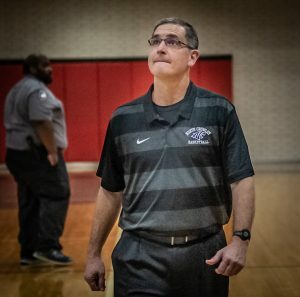 The Panthers, as they have done the majority of the season, continued to methodically stretch their lead against their opponent throughout the second half of play. 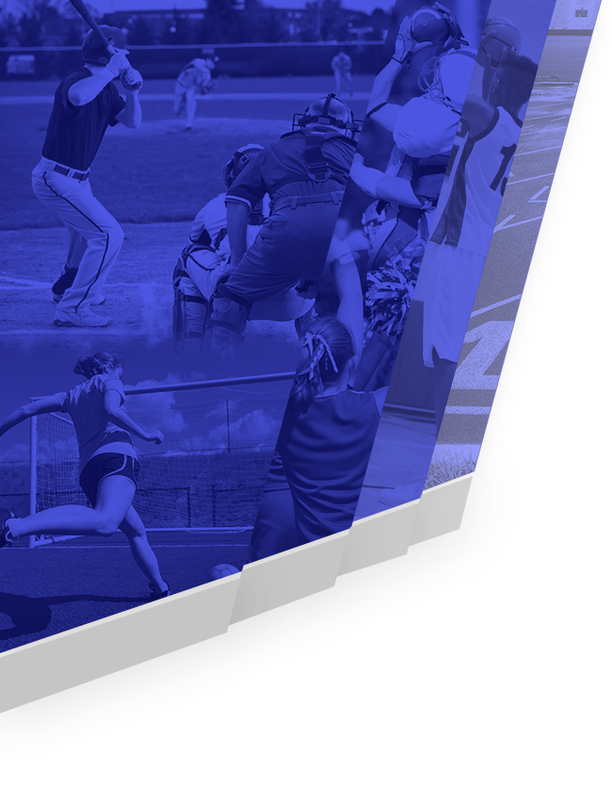 North Crowley outscored Arl. Martin 16-12 in the third quarter taking a 9 point, 40-31 lead into the final quarter. The Panthers defense stayed focused and continued to wear down the Warriors and out score them 17-7 in the final 8 minutes of the game. Final: 57-38 North Crowley! With all of the Panthers’ defense Friday night, the Panthers’ offense, #2 in 4-6A at 58.6 ppg, showed up as well! The Panthers were led by the efficient scoring of Crawford, Wyatt, Chambers & Gates who shot a combined 23-35 (66%) from the field and 5-7 (71%) from three. Crawford, the 6’6″ Senior, led all scorers with 21 points for the game. Wyatt, a 6’3″ Senior (who was called on to play 4 different positions on Friday night from point guard to power forward) finished with 18 points and connected on 4-6 from three. 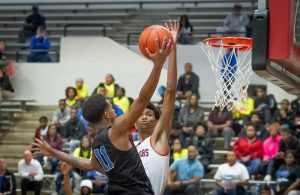 Chambers, a 6’2″ Junior Guard, rounded out the Panthers double figure scoring with 10 points on a perfect shooting night that saw him go 4-4 from the field and 2-2 from the line. Gates, a 6’8″ Senior Forward, battled 6’9″ Warrior Center Montreal Pena all night on the defensive end of the floor & still managed to go 3-4 from the field, including in emphatic dunk back over Pena in the second quarter. Gates & Crawford led the Panthers in rebounding with 6 apiece & Senior Wing, Chris Jordan & Crawford led the Panthers in assists with 3 each. Crawford also recorded a game high 3 blocked shots. 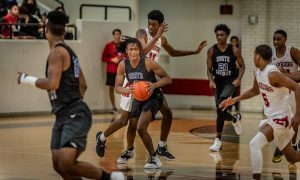 The North Crowley win, which clinched the district championship, moved their overall record to 29-3 on the season and kept them perfect in District 4-6A action at 13-0. The district championship for the Panthers was an unheard of 17th in the last 19 seasons. Their guaranteed playoff appearance is the 20th time the Panthers will see the post-season in the 21 years the school has been open & their 20+ wins is the 20th time. With one more win… the Panthers will hit the 30 win mark 10th time as a program. The Panthers return home on Tuesday night to face the Arl. Sam Houston Texans at 7:30pm & then will be at FWISD’s Billingsley Fieldhouse on Friday at 8:00pm to face the Trimble Tech Bulldogs.